The chill can sometimes lead to frost. The past few mornings we have seen lows reaching 28-34 causing frost to set in close to sunrise. It may not seem that cold standing in front of the golf shop, but I assure you it is that cold and there is frost on the golf course. It is an inconvenience for maintenance too, not just golfers. Frost is basically frozen dew that has crystallized on the grass, making it hard and brittle. A grass blade is actually 90 percent water, therefore it also freezes. Because of the short mowing height and fragile nature of the turf, putting greens are most affected by frost. 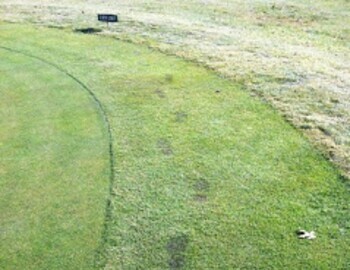 Walking on frost-covered greens causes the plant to break and cell walls to rupture, thereby losing its ability to function normally. When the membrane is broken, much like an egg, it cannot be put back together.